About 6,000 Chinese schoolchildren have been sent home amid fears for the safety of buildings near the site of an explosion on Tuesday, state media says. Two trucks packed with explosives blew up while they were in a repair garage, killing eight people and leaving more than 200 wounded. Officials in Fuquan city, Guizhou province, ordered schools closed while they carried out safety tests. 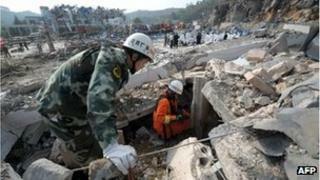 The state-run Xinhua news agency said some 50 schoolchildren and seven teachers were among those hurt in the blast. Six schools had windows shattered by the blast and were ordered to be shut, the agency quoted local education officials as saying. Analysts say Chinese officials are particularly sensitive about safety standards in schools, after many schoolchildren died in an earthquake in Sichuan province in 2008. The government was criticised by the children's families, who questioned why schools had collapsed but many other buildings - including government offices - were still standing. The Fuquan explosion wrecked buildings and scattered shards of glass - one of the main causes of injuries. An eyewitness described being blown of his feet by the power of the blast. "I stood up and ran to the houses over there for shelter, but when I got there, the houses were all smashed," he said. Medical officials warned that the death toll could rise because several of those being treated in hospital had been seriously injured.